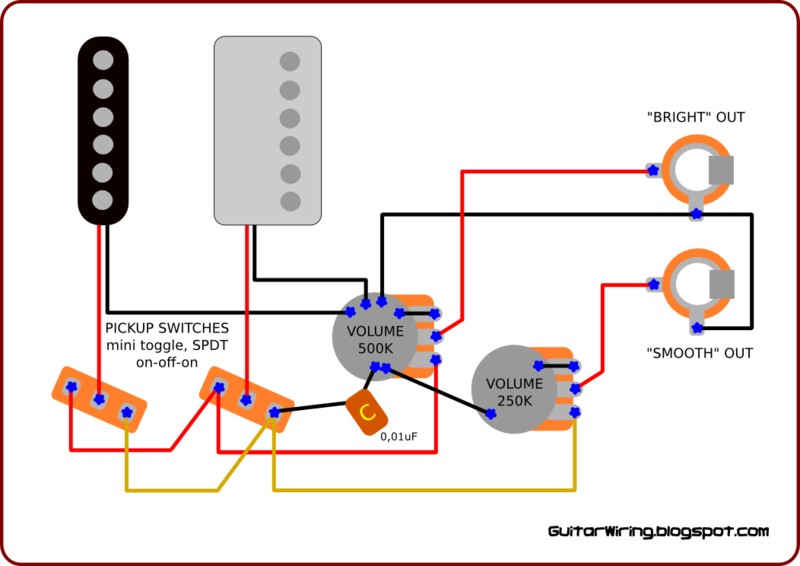 This is my project of the quite simple stereo (two channels) guitar wiring. Every channel of the wiring has got his own, unique tone characteristic and his own, separate output socket. It is something very useful, if you want to connect your guitar to two amps, or to two different sets of effects. It is also useful for recording in studio. It allows you to record two, different sounding, but symmetrical tracks. You can use them together, as stereo guitar tracks, or chose only one, because it will be the best sounding track for some part of your song. There is also possibility to use this wiring as a mono circuit, by choosing only one output (channel) from two. In standard wirings you don't have that kind of choice. As you can see, the guitar outputs (channels) names are: „bright” and „smooth”. „Bright” channel is a part of the wiring with the 500K volume potentiometer, connected between pickup switches and the output socket. It will not affect the signal very much. 500K pot (in connection with pickup) will make some kind of treble peak in the signal frequency characteristic. „Smooth” channel has got the 250K volume potentiometer, and low pass filter capacitor (0,01uF). With this parts, signal will lost some treble, so tone will be much smoother and warm. Pickup switches are not typical for a guitar. They are SPDT, on-off-on toggle switches. Every pickup has got his own one. In the middle position of the switch, pickup is disconnected. In other positions, pickup is connected to one of channels – to the „bright” or to the „smooth” part of the wiring. This switching system allows you to choose, which pickup and which channel will be connected together. You can also connect both pickups to one channel.